American Legion Family members of Post 168 in Pana, Ill., are paying respect to fellow veterans in hospice care during their final days, even hours. 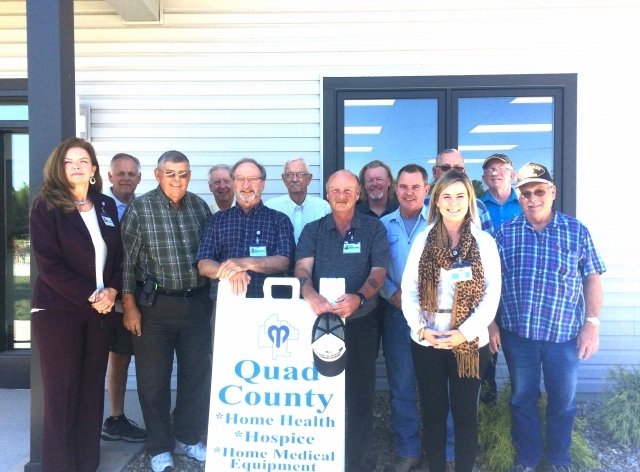 The Legion Family members are part of the Quad County Hospice “No Veteran Will Die Alone” program that was initiated less than a year ago to honor a hospice veteran’s military service and sacrifice. Through the program, veterans visit other veterans in hospice care either at home, a nursing facility or hospital and conduct a special pinning and award presentation ceremony. The No Veteran Will Die Alone program serves four counties and consists of 13 volunteers, with six of them from Legion Family Post 168 as well as Shelbyville Post 81, Nokomis Post 94 and Oconee Post 317. The ceremony begins with patriotic, gospel or other types of music performed by a volunteer music therapist on guitar or violin. Then the program volunteers march into the patient’s room carrying the American flag, as well as the veteran’s military branch of service flag. Moss offers a special prayer and then the pin is placed on the veteran. The pin is an American flag with the word “Veteran” and a service branch pin is attached. Sons of The American Legion Squadron 168 member Earl Baker said many times the families never knew how important it was for their loved one to receive this honor because their military service was never shared. Once the program volunteers introduce themselves and their branch of service, the patient will often reminisce about his or her time in service. The five- to 20-minute ceremony ends with a proper salute. Clemons said oftentimes before he can even call the group to attention to present arms, the patient is saluting. “These ceremonies are very emotional for us as well as for the families,” he said. After the patient passes, Clemons said their services to the family do not end. Post 168’s honor guard has provided military services at funerals, and they follow up with bereavement visits. “I just saw the daughter of the very first recipient of our program yesterday at the grocery store and we hugged. Once they pass we don’t forget the families,” Clemons said.